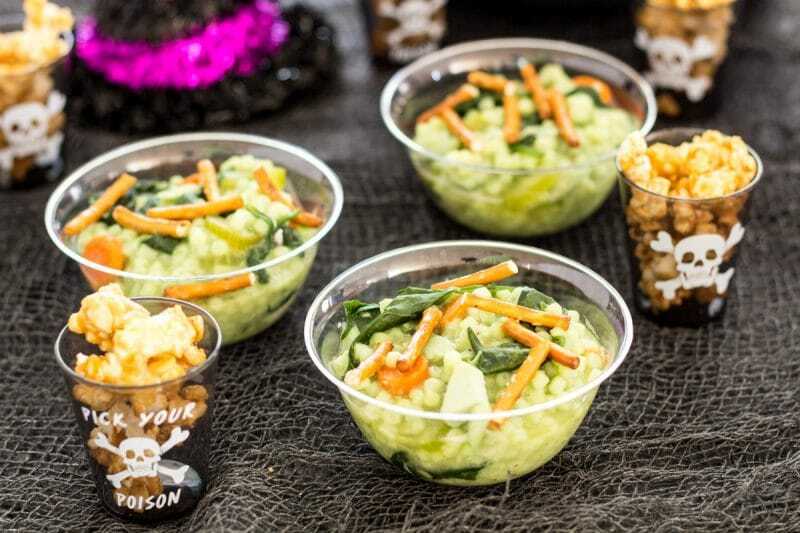 Witch’s Stew is just a Halloween party variation of Frog Eye Soup. Frog Eye Soup is just a variation of chicken and pasta that had been started as a soup recipe and turned into more of a pasta dish. But the name has stuck in our family for about 20 years. Frog Eye Soup got its name from the pasta shape that I had on hand for a Frog Eye Salad. For those of you who have never heard of Frog Eye Salad, it is kind of a sweet dish in which ambrosia and pasta salad got mixed up in the same bowl. It was very popular in the 60’s and 70’s. I’ll try to make some in time for the spring holidays. Right now, my house is in full fall and winter holiday prep. For the blog anyway, you won’t find any carved pumpkins, graveyard scenes, or Christmas trees in the house just yet. But give it another month and you might. Anyway, Witch’s Stew just has the addition of some food coloring, spinach, and pretzels on top. 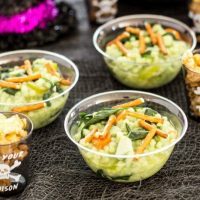 It’s playful enough to serve at a Halloween party, but filling enough to be served as a main dish at any Halloween event. It’s also a great way to hide spinach from those kids that just don’t like eating vegetables. Alternately, instead of green food coloring, you could replace some of the chicken broth with beef broth. It will change the broth to a murky color. Honestly, when I am making Won Ton Soup, I use 1 can of condensed broth to make a darker, richer broth without adding soy sauce. You could even make this with beef instead of chicken. 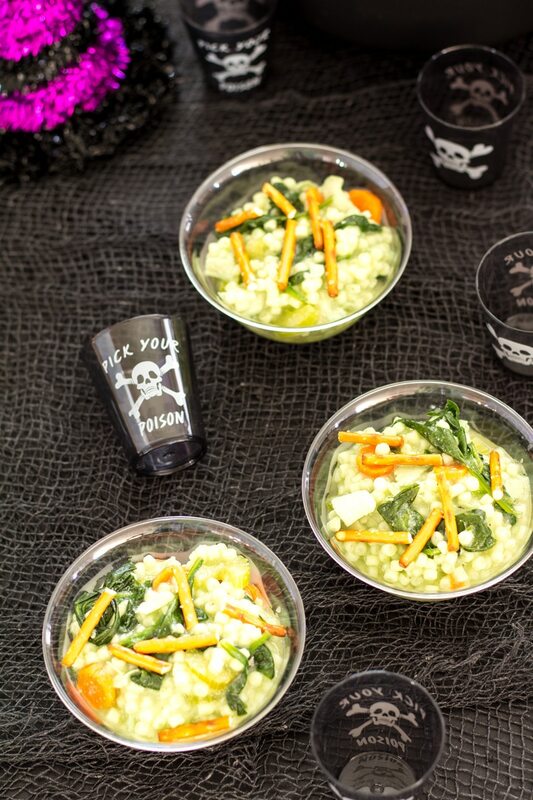 This dish is easy to dress up for Halloween too. Just hit a dollar store for a witch’s kettle and some skeleton salad tongs. $2 and done!! Any food bloggers out there looking for food photo prop tips, here is one! The dollars stores are full of things that are only $1. I have seen dinnerware, flatware, and all kinds of small items that can be used as props. They even have floral items for different holidays. $1 is cheap enough that you can buy more than one item. If it doesn’t work in your current shot, save it for another day. Before you know it, you will have a large collection of holiday-themed props to bring color or a season into a shot. The items tend to be small enough that they will not eat up your entire shooting area. Even if you do not buy anything during your trip, you might find yourself inspired. Add anything else you think would fit your party theme. Long thick whole wheat pasta for worms perhaps, the sky is the limit. Add chicken broth, onion, and bouillon to a large saucepot. Add chicken breast, reduce to simmer. Cook until chicken is cooked through, 30 to 60 minutes. Add carrots, celery, and pasta. Boil for 3 to 4 minutes, stirring frequently. Reduce heat to medium and continue to cook until pasta is fully cooked. Stir frequently to keep pasta from sticking to the bottom of the pot. The broth will soak into the pasta. Add spinach and stir into soup. Add green food coloring a few drops at a time until the desired coloring is reached. Add more water if a soupier soup is desired. Pasta will continue to swell as it cools. Pearl couscous may be used to substitute acini de pepe. Cook until couscous is tender.